In 1924, two Marist fathers, Père Henri Gerard, S.M. and Père Louis LeBihan, S.M., founded Ecole Notre Dame des Victoires. Acting upon the encouragement of Archbishop Edward J. Hanna, they were eager to establish the school as a center of French culture – a Catholic school where students would learn French as well as English. The school, located at the site of the church for which it is named, opened on January 24, 1924 with a small enrollment. Although Notre Dame des Victoires began with these fourteen students, the formal opening of the school took place on August 18, 1924 with an enrollment that had grown to 123 students. At this time, Sister Mary Charles Lirette, C.S.J. was appointed principal. She remained in that position until 1946. The school was entirely staffed for many years by the Sisters of St. Joseph of Orange (CSJ). Today, while sisters are no longer present; however, the lall lay staff continues to embrace the CSJ charism through their participation in the CSJ Educational Network which promotes Catholic identity, fosters personal and professional excellence, reverences the dignity of all persons, and educates for justice. In 1949, Père LeBihan, S.M. expanded the school to include five additional classrooms, a library, science laboratory, as well as a convent. In May 2006, the church of Notre Dame des Victoires celebrated its one hundred fiftieth anniversary. The school now has an enrollment of approximately 300 students, drawn from the greater Bay Area and representing many diverse ethnic backgrounds. NDV continues to provide the unique educational experience envisioned by its founders. The formal opening of Ecole Notre Dame des Victoires took place on August 18, 1924 with an enrollment of 123 students. At this time, Sister Mary Charles Lirette, C.S.J. was appointed principal and remained in that position until 1946. 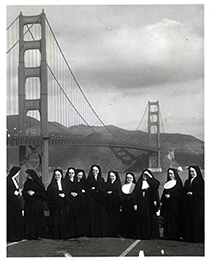 The school was entirely staffed for many years by the Sisters of St. Joseph of Orange (CSJ). Today, while the sisters are no longer present, NDV continues to embrace the CSJ charism through our membership in the CSJ Educational Network which promotes Catholic identity, fosters personal and professional excellence, reverences the dignity of all persons, and educates for justice. Catholic Identity – We support a curriculum and environment based on Scripture, tradition, the teachings and lived experience of the Catholic Church. Justice – We are called to participate in the mission of Jesus by reaching out to the global community and our earth with compassion and responsibility. Excellence – We foster personal and professional development, accountability, innovation, teamwork, and commitment to quality. Dignity – We live and work in a manner that is deeply respectful of the uniqueness and intrinsic value of each person. Ecole Notre Dame des Victoires (NDV) is a Marist School of the North American Province of the Society of Mary. The Marist Fathers and Brothers at NDV are actively involved in the life of the school. With Mary as their model, Marists live compassionately and mercifully as the mother and first disciple of Jesus. Teachers participate in meetings and workshops with other Marist Schools. Parents and staff are encouraged to attend gatherings on Marist Spirituality offered once a month at the NDV rectory. Students learn about Marist spirit throughout the year. Marist Week, once known as St. Peter Chanel week, is celebrated the last week of April. St. Peter Chanel was the first Marist martyr and an example of an individual who patterned his life after Mary. The school also has a chapel dedicated to St. Peter Chanel which is open to students throughout the school year. The annual Mission Carnival is held on the school playground in May. Proceeds are sent to St. Joseph’s, a Marist School, located in Raratonga, Fiji in the South Pacific.